Stuart Katchis, M.D. is a leader in treating bunions and performing bunion correction surgeries. He has helped hundreds of patients get back on their feet pain-free with remarkable results. Whether your condition has just recently developed and can be effectively treated with nonsurgical options, or it is more advanced and requires surgery, Extend Orthopedics will plan and implement a treatment plan tailored to your needs. 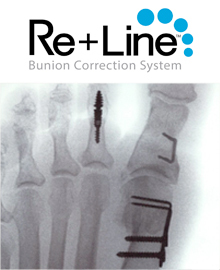 For those patients needing bunion surgery, Extend Orthopedics is pleased to offer a cutting-edge procedure using the Re+Line® Bunion Correction System, a proprietary system that Dr. Katchis helped develop. The Re+Line® technology offers a unique, low profile tension band compression plate that delivers more precision, control and, best of all, faster recovery times for patients. A bunion, also referred to as hallux valgus, is a condition characterized by a bump on the side of the big toe that indicates a displacement of the metatarsophalangeal joint, which is located at the base of the big toe. While the bump along the side of the foot may be the most noticeable part of the condition, the deformity actually has to do with a shifting of the bony framework within the front part of the foot. It sometimes involves multiple bones drifting out of alignment. Bunions are one of the most common problems affecting the forefoot. As a progressive disorder, symptoms get worse over time. A bunion is caused when the metatarsophalangeal joint becomes unstable, which can lead to a partial or complete dislocation. As a result, the big toe begins drifting toward the second toe and the metatarsophalangeal joint starts to jut out on the outer edge of the foot. In nearly all cases, a bunion can be explained by an abnormal foot structure or abnormal foot mechanics that cause an imbalance of pressure on the ball of the foot and toe joints, eventually leading to instability in the big toe joint. Experts disagree on whether or not wearing tight or narrow shoes that crowd the toes actually causes bunions. Nevertheless, wearing ill-fitting footwear may speed up the progression of the condition. You may also experience numbness in the affected area and have difficulty finding comfortable footwear. In other cases, some patients with bunions may not experience any symptoms at all. 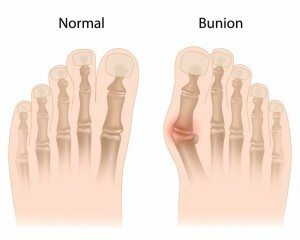 What are the risk factors for a bunion? If you are experiencing pain or soreness at the base of the big toe joint that may be accompanied by a bump along the outer edge of the toe, call our office at 212‑434‑4920 or fill out the schedule appointment form on this page so Stuart Katchis, M.D. can evaluate and diagnose your condition. A bunion is a progressive condition that gets worse over time and treatment outcomes are significantly improved if medical evaluation is sought when symptoms first start. Most symptoms of a bunion can be improved with nonsurgical treatments, but in more severe cases, surgery may be recommended. Taking over-the-counter anti-inflammatory medications can considerably reduce pain. If necessary, Dr. Katchis may prescribe a stronger medication to improve your comfort level. Trade out tight, narrow shoes and high heels for wider shoes with soft, supportive soles. A wider foot bed and comfortable insole will allow the foot to spread out with less stress placed on the big toe joint. Taping and properly padding the big toe will provide it with more stability and insulation, which may significantly reduce pain and stress on the joint. Surgery may be required if nonsurgical treatments have not proven effective for improving symptoms and relieving pain, particularly in cases of more severe bunions. The type of surgical procedure recommended by Dr. Katchis will depend upon each patient’s unique situation. A procedure for milder bunions or used in combination with other procedures, the surgery involves Dr. Katchis surgically removing damaged tissue then shortening the loose tissues and lengthening the tight tissues surrounding the big toe joint. This resizing of connective tissues around the big toe joint realigns the toe and helps it to stay in a straight position. A cutting-edge realignment procedure for moderate to severe bunions that repositions and stabilizes the big toe joint using a unique, low profile tension band compression plate. The surgery involves Dr. Katchis inserting a proprietary bunion correction device along the side of the big toe that provides stable fixation of the big toe joint with long-lasting results. A procedure utilized for more severe bunions, the surgery involves Dr. Katchis removing the damaged joint surfaces and fusing together the bones of the big toe joint. Special devices may be inserted to keep the bones in place while they heal together. After healing, the big toe will be fixed (unbendable), but pain is significantly reduced or eliminated. A procedure that is typically performed in older patients with severe bunions, the surgery involves Dr. Katchis removing the damaged portion of the big toe joint. The surgery creates a flexible scar joint in the big toe. Surgical treatment for a bunion involves several weeks or months of recovery depending on the type of surgery performed. With any type of surgery for this condition, it may require you to wear a firm and flat postoperative shoe to protect your foot while the bones heal. Whether you undergo nonsurgical or surgical treatment for a bunion, Stuart Katchis, M.D. will provide recommendations for long-term measures designed to keep your symptoms from returning, such as footwear modifications and orthotics.